Ludwik Witold Rajchman was a Polish physician and bacteriologist. He is regarded as the founder of UNICEF, and served as its first Chairman from 1946 to 1950. UNICEF relies on contributions from governments and private donors. UNICEF's total income for 2015 was US$5,009,557,471. Governments contribute two-thirds of the organization's resources. Private groups and individuals contribute the rest through national committees. It is estimated that 92 per cent of UNICEF revenue is distributed to program services. UNICEF's programs emphasize developing community-level services to promote the health and well-being of children. UNICEF was awarded the Nobel Peace Prize in 1965 and the Prince of Asturias Award of Concord in 2006. UNICEF's Supply Division is based in Copenhagen and serves as the primary point of distribution for such essential items as vaccines, antiretroviral medicines for children and mothers with HIV, nutritional supplements, emergency shelters, family reunification, and educational supplies. A 36-member executive board establishes policies, approves programs and oversees administrative and financial plans. The executive board is made up of government representatives who are elected by the United Nations Economic and Social Council, usually for three-year terms. Copenhagen is the capital and most populous city of Denmark. As of July 2018, the city has a population of 777,218. It forms the core of the wider urban area of Copenhagen and the Copenhagen metropolitan area. Copenhagen is situated on the eastern coast of the island of Zealand; another small portion of the city is located on Amager, and is separated from Malmö, Sweden, by the strait of Øresund. The Øresund Bridge connects the two cities by rail and road. An emergency shelter is a place for people to live temporarily when they cannot live in their previous residence, similar to homeless shelters. The main difference is that an emergency shelter typically specializes in people fleeing a specific type of situation, such as natural or man-made disasters, domestic violence, or victims of sexual abuse. A more minor difference is that people staying in emergency shelters are more likely to stay all day, except for work, school, or errands, while homeless shelters usually expect people to stay elsewhere during the day, returning only to sleep or eat. Emergency shelters sometimes facilitate support groups, and/or provide meals. There are national committees in 38 [industrialized] countries, each established as an independent local non-governmental organization. The national committees raise funds from the public sector. Non-governmental organizations, nongovernmental organizations, or nongovernment organizations, commonly referred to as NGOs, are usually non-profit and sometimes international organizations independent of governments and international governmental organizations that are active in humanitarian, educational, health care, public policy, social, human rights, environmental, and other areas to effect changes according to their objectives. They are thus a subgroup of all organizations founded by citizens, which include clubs and other associations that provide services, benefits, and premises only to members. Sometimes the term is used as a synonym of "civil society organization" to refer to any association founded by citizens, but this is not how the term is normally used in the media or everyday language, as recorded by major dictionaries. The explanation of the term by NGO.org is ambivalent. It first says an NGO is any non-profit, voluntary citizens' group which is organized on a local, national or international level, but then goes on to restrict the meaning in the sense used by most English speakers and the media: Task-oriented and driven by people with a common interest, NGOs perform a variety of service and humanitarian functions, bring citizen concerns to Governments, advocate and monitor policies and encourage political participation through provision of information. UNICEF is funded entirely by voluntary contributions,  and the National Committees collectively raise around one-third of UNICEF's annual income. This comes through contributions from corporations, civil society organizations around six million individual donors worldwide. In the United States, Nepal and some other countries, UNICEF is known for its "Trick-Or-Treat for UNICEF" program in which children collect money for UNICEF from the houses they trick-or-treat on Halloween night, sometimes instead of candy. In 2013, they agreed a contract with Greek association football champions Olympiacos F.C. who will show the organization's logo on the front of their shirts. Started in 2015, Kid Power is a division of UNICEF that was created as an effort to involve kids in helping other kids in need. UNICEF Kid Power developed the world's first Wearable for Good,  called Kid Power Bands,  which is a kids’ fitness tracker bracelet that connects to a smartphone app. The app lets users complete missions, which counts total steps and awards points. The points then unlock funding from partners, which is then used by UNICEF to deliver lifesaving packets of therapeutic food to severely malnourished children around the world. In 1994, UNICEF held a summit encouraging animation studios around the world to create individual animated spots demonstrating the international rights of children. Cartoons for Children's Rights is the collection of animated shorts based on UNICEF's Convention on the Rights of the Child. To raise money to support its Education and Literacy Programs, UNICEF collaborates with companies worldwide – international as well as small- and medium-sized businesses. Kids United is a French musical group of four children (six children when the group was formed) born between 2000 and 2007. It has been created to support UNICEF campaigns and is sponsored by Hélène Ségara and Corneille, two Francophone singers. The first album Un monde meilleur (A better world) was launched on Universal Children's Day in 2015, it received gold certification in France. The second album Tout le bonheur du monde was even certified 2x platinum. U-Report is a free SMS social monitoring tool and real-time information system for community participation, designed to strengthen community-led development, citizen engagement, and positive change. SMS polls and alerts are sent out to U-reporters and real-time response information is collected. Results and ideas are shared back with the community. Issues polled include among others health, education, water, sanitation and hygiene, youth unemployment, HIV/ AIDS, disease outbreaks; social welfare sectors. The initiative is currently operational in 41 countries and covers more than 3 million people. The old UNICEF World Warehouse is a large facility in Denmark, which hosts UNICEF deliverable goods as well as co-hosts emergency goods for United Nations High Commissioner for Refugees (UNHCR) and the International Federation of Red Cross and Red Crescent Societies (IFRC). Until 2012 the facilities was a 25,000m2 warehouse at Marmormolen in Copenhagen. With construction of a 45,000m2 UN City that is to house all UN activities in Copenhagen under one roof,  the warehouse service has been relocated to outer parts of the Freeport of Copenhagen. The facility houses the UNICEF Supply Division which manages strategic transport hubs in Dubai, Panama and Shanghai. 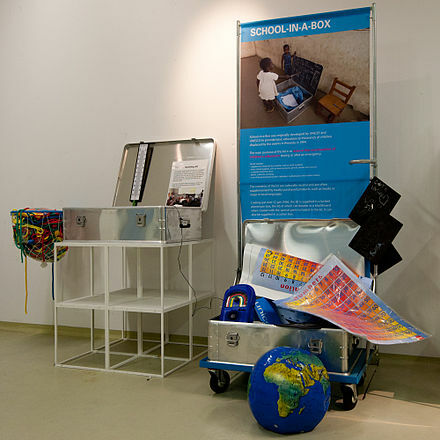 The warehouse contains a variety of items, e.g., food supplements, water purification tablets, dietary and vitamin supplements, and the "School in a box" (illustrated above). 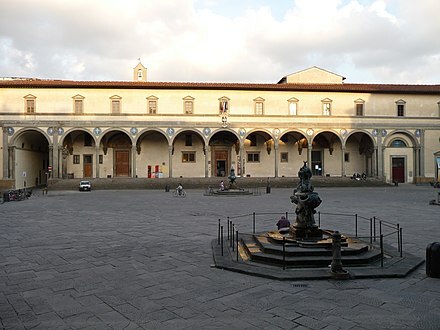 The UNICEF Innocenti Research Centre in Florence, Italy, was established in 1988. The centre, formally known as the International Child Development Centres, has as its prime objectives to improve international understanding of issues relating to children's rights, to promote economic policies that advance the cause of children, and to help facilitate the full implementation of the United Nations Convention on the Rights of the Child in industrialized and developing countries. The program for 2006–2008 was approved by UNICEF Executive Board in September 2005. One concern is that the child mortality rate has not decreased in some areas as rapidly as had been planned, especially in Sub-Saharan Africa, where in 2013 "the region still has the highest child mortality rate: 92 deaths per 1000 live births". and that "Globally, nearly half of under-five deaths are attributable to undernutrition." 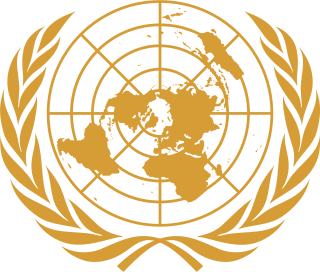 The United Nations Foundation was launched in 1998 with a $1 billion gift from Ted Turner to support the United Nations causes. The creation of the Foundation was intended to encourage other donors to also support the UN in its activities. The main issue areas that the Foundation addresses are child health, climate change & energy, sustainable development, technology, women, girls, and population, and supporting the United Nations. Some of the biggest global campaigns that the UN Foundation has been involved in include Nothing But Nets, the Measles & Rubella Initiative, the Global Alliance for Clean Cookstoves, Girl Up, Shot@Life, the Digital Impact Alliance, and the Better World Campaign, among others. Ann Margaret Veneman was the Executive Director of UNICEF from 2005 to 2010. Her appointment was announced on January 18, 2005 by UN Secretary-General Kofi Annan. Previously, Veneman was the United States Secretary of Agriculture, the first, and as of 2018 the only, woman to hold that position. Veneman served as USDA Secretary from January 20, 2001 to January 20, 2005, leaving to become the fifth executive director of UNICEF. She served in this position from May 1, 2005. A lawyer, Veneman has practiced law in Washington, DC and California, including being a deputy public defender. She has also served in other high level positions in U.S. federal and state government, including being appointed California's Secretary of Food and Agriculture, serving from 1995 to 1999. Graça Machel is a Mozambican politician and humanitarian. She is the widow of both South African President Nelson Mandela and Mozambican President Samora Machel. Machel is an international advocate for women's and children's rights and was made an honorary British Dame by Queen Elizabeth II in 1997 for her humanitarian work. Carol Bellamy is the Chair of the Board of the Global Community Engagement and Resilience Fund (GCERF). Previously, she was Director of the Peace Corps, Executive Director of the United Nations Children's Fund (UNICEF), and President and CEO of World Learning. She is also the Chair of children’s rights advocacy organization ECPAT International, working to end the sexual exploitation of children. After three terms in the New York State Senate, she was the first woman to be elected as President of the New York City Council, a position she held until her unsuccessful bid for Mayor of New York in 1985; she was the second to last person to hold this position. Trafficking of children is a form of human trafficking and is defined as the "recruitment, transportation, transfer, harboring, and/or receipt" of a child for the purpose of slavery, forced labor and exploitation. This definition is substantially wider than the same document's definition of "trafficking in persons". Children may also be trafficked for the purpose of adoption. Formed in 2004, Global Action for Children (GAC) GAC was a results-oriented coalition dedicated to improving the lives of orphans and highly vulnerable children in the developing world. Measles & Rubella Initiative (MRI), launched in 2001, is a long-term commitment and partnership among leaders in public health and supports the goal of reducing measles deaths globally by 90% by 2010 compared to 2000 estimates. Kul Chandra Gautam is a distinguished diplomat, development professional, and a former senior official of the United Nations. Currently, he serves on the boards of several international and national organizations, charitable foundations and public-private partnerships. 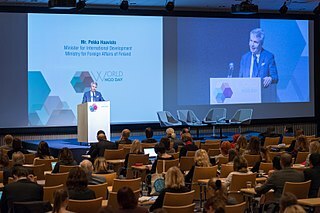 Previously, he served in senior managerial and leadership positions with the United Nations in several countries, in a career spanning over three decades. As a former deputy executive director of UNICEF and Assistant Secretary-General of the United Nations, he holds extensive experience in international diplomacy, development cooperation, and humanitarian assistance. The Alliance for Safe Children (TASC) is a non-profit organization formed in 2002 to address the issue of child injury in the developing world. The founder is Pete Peterson, former United States Ambassador to Vietnam. Michael Linnon is the technical director. Bilaal Rajan is a fundraiser, motivational speaker, author, United Nations Children's Fund (UNICEF) Canada's child ambassador, and founder of the Making Change Now organization. UNICEF UK, also known as the United Kingdom Committee for UNICEF, is one of 36 UNICEF National Committees based in industrialised countries. The National Committees raise funds for the organisation's worldwide emergency and development work. In 2007, UNICEF UK raised £41.3 million for UNICEF’s work with children worldwide. UNICEF UK also advocates for lasting change for children. For example, it works to change government policies and practices that are detrimental to children’s rights in the UK and internationally. 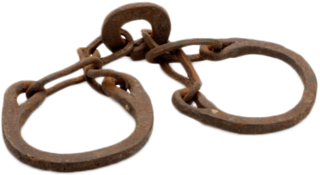 The United Nations Global Initiative to Fight Human Trafficking (UN.GIFT) is a multi-stakeholder initiative providing global access to expertise, knowledge and innovative partnerships to combat human trafficking. Rakesh Rajani is a Tanzanian and global civil society leader. He has established and led many key social initiatives in the evolution of education in Tanzania and East Africa starting in 1991 including, familiar to many people in Tanzania, especially as a vocal advocate for young people through education and recently, with and, open government and ICT. In addition he helped set up and served as the first chairman of Policy Forum, a network of over 100 NGOs in Tanzania involved in helping 'policies work for people'. Rajani is considered a thought leader for much International Development work, particularly related to child rights, education, democracy and open government in East Africa and globally. The UNICEF East Asia and Pacific Regional Office, also known as UNICEF EAPRO, is one of seven regional offices that support the work of the United Nations Children's Fund. Globally, UNICEF works to promote children's rights in over 150 developing countries. UNICEF Canada, also known as the Canadian National Committee for UNICEF, is one of 36 UNICEF National Committees based in industrialized countries. UNICEF is a child-focused humanitarian organization, working in over 190 countries. 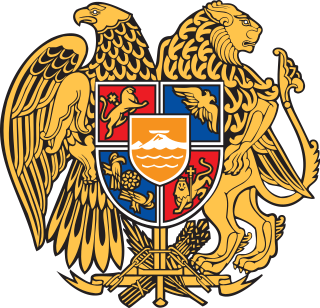 The Republic of Armenia was admitted into the United Nations on March 2, 1992. Since December 1992 when UN opened its first office in Yerevan, Armenia signed and ratified many international treaties. There are fifteen specialized agencies, programs and funds in the UN Country Team under the supervision of the UN Resident Coordinator. Besides, the World Bank (WB), International Finance Corporation (IFC) and International Monetary Fund (IMF) have offices in the country. The focus is drawn to the attainment of the Millennium Development Goals (MDGs) stipulated by the Millennium Declaration adopted during the Millennium Summit in 2000. The MDGs have simulated never before practiced actions to meet the needs of the world's poorest. As the MDG achievement date of December 2015 draws closer a new set of global sustainable development goals is consulted worldwide, to be adopted by the UN General Assembly in September 2015. Armenia was included in the initial group of 50 countries to conduct national consultations on the global Post-2015 development agenda. This page is a timeline of global health, including major conferences, interventions, cures, and crises. The Republic of Azerbaijan has been a member in the United Nations since March 2, 1992 after the UN General Assembly admitted Azerbaijan at its 46th session. The Permanent Mission of the Republic of Azerbaijan was opened in New York in May 1992. On October 29, 1991, soon after gaining independence from the Soviet Union, Azerbaijan applied to the UN General Assembly for joining the organization. Azerbaijan was elected as a non-permanent member of the UN Security Council for the term of 2012-2013. The election of such a young country by a majority vote of 155 Member States clearly indicated international recognition of the country's growing role in world affairs and its contribution to global peace and security.Through the UN, Azerbaijan has reached out to the international community, especially Europe. Azerbaijan strengthened its relations with UN by cooperating with UN agencies and bodies such as International Monetary Fund, the World Bank, the World Food Programme, and the financial institutions of UN. ↑ "Fifty years for children" . Retrieved 9 July 2015. ↑ "About UNICEF - FAQ". UNICEF. 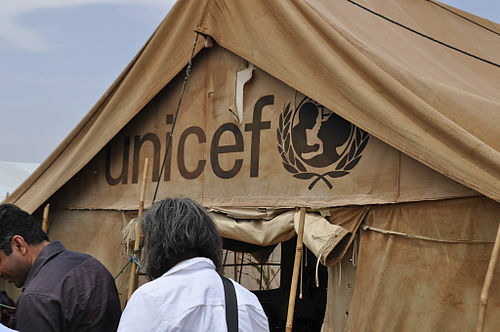 What does the acronym UNICEF stand for?. Retrieved 4 April 2017. ↑ Luk Van Wassenhove; Joachim Mikalsen; Charles Delagarde (April 27, 2017). "Agility Under Pressure". Insead. ↑ "How UNICEF works". UNICEF. Retrieved 2017-06-06. ↑ "Home". UNICEF. Retrieved 2017-06-06. ↑ "Bureau". UNICEF. Retrieved 2017-06-06. ↑ "Information by country". UNICEF. 2014-03-17. Retrieved 2014-08-03. ↑ Press center – HRH Grand Duchess of Luxembourg becomes Eminent Advocate for Children. UNICEF. Retrieved on 2012-03-26. 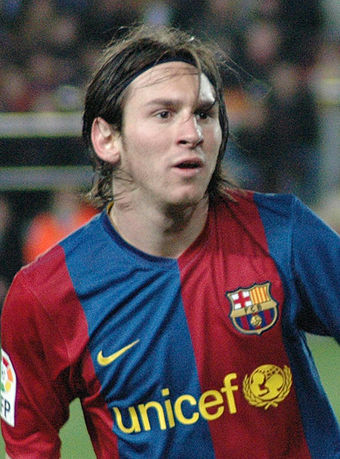 ↑ "Futbol Club Barcelona, UNICEF team up for children in global partnership". UNICEF. 7 September 2006. ↑ Pete Jenson (February 25, 2016). "Barcelona Sign New Four-Year Deal With Unicef and Will Next Target New Contracts for Neymar and Sergio Busquets". Daily Mail. ↑ "UNICEF" . Retrieved 9 July 2015. ↑ Diego Mejia (October 5, 2007). "Grapevine: Villenueuve to Race for UNICEF". Autosport. ↑ "Sydney FC and UNICEF do the rights things to improve child rights throughout Asia". UNICEF. 20 February 2012. Retrieved 24 February 2012. ↑ "UNICEF funds TeachAIDS work in Botswana". TeachAIDS . 2 June 2010. Retrieved 16 December 2010. ↑ "International Charity Partner – UNICEF". Rangers Charity Foundation. 10 September 2010. Retrieved 4 May 2011. ↑ "Digital Humanitarian Missions: UNICEF Kid Power". Wired Magazine. ↑ "UNICEF Kid Power Bands". UNICEF Kid Power. ↑ Smylie, James H. (2001-01-01). "Presbyterians initiated UNICEF's 'Trick-or-Treat' program 50 years ago". The Presbyterian Outlook. Archived from the original on 2010-11-28. ↑ "Trick-or-Treat for UNICEF". unicefusa.org. Archived from the original on 23 April 2013. ↑ "Montblanc | UNICEF's corporate partnerships". UNICEF. Retrieved 2014-08-03. ↑ Rogers, Emma (June 4, 2013). "Merck for Mothers contributes to UNICEF's South African efforts". Vaccine News Daily. Retrieved 6 June 2013. ↑ "Crucell announces new award of $110 million for paediatric vaccine Quinvaxem by UNICEF". Leiden Bio Science Park. May 10, 2010. Archived from the original on August 8, 2014. ↑ "Corporate Social Responsibility - Home". UNICEF. Retrieved 2014-08-03. ↑ "UNICEF India - Media centre - Girl Star Project". Unicef.org. 2007-11-22. Retrieved 2014-08-03. ↑ "UNICEF Ambassadors". UNICEF:United States Fund. UNICEF. Retrieved 28 April 2016. ↑ By & Havn. "FN Byen" (in Danish). Archived from the original on 2012-09-01. Retrieved 2012-07-06. 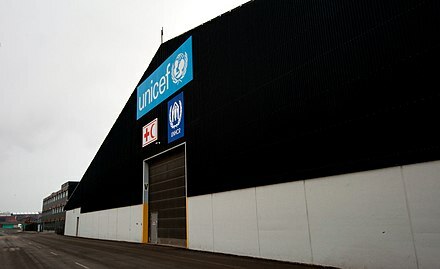 ↑ "Copenhagen warehouse - Supplies and Logistics - UNICEF". UNICEF. 5 June 2015. Retrieved 9 July 2015. ↑ "Bartholet article on human rights and adoption" (PDF). ↑ "Both Ends Burning" . Retrieved 9 July 2015. ↑ Peter Roff. "Bureaucracy Keeps Adopted Children Stuck in International Limbo - US News". US News & World Report. Retrieved 9 July 2015. ↑ Danzhen You, Lucia Hug and Yao Chen, "Levels and Trends in Child Mortality: Report 2014: Estimates Developed by the UN Interagency Group for Child mortality Estimation" Archived 2015-08-14 at the Wayback Machine . Published by the United Nations Children's Fund, The World Bank, the World Health Organization and the United Nations Population Division, 2014. Retrieved August 1, 2015. p. 1. ↑ Horton, Richard (2004). "UNICEF leadership 2005–2015: a call for strategic change". The Lancet. 364 (9451): 2071–2074. doi:10.1016/S0140-6736(04)17560-0. PMID 15589292. (United Nations Children's Fund) .